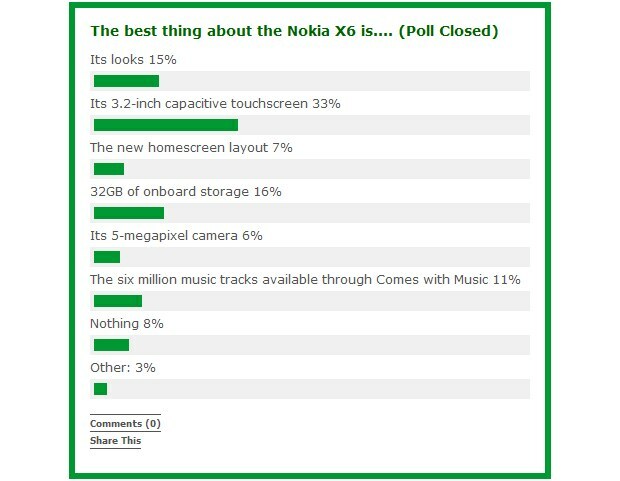 Nokia Conversations recently had a poll asking readers for their favorite Nokia X6 feature. The winning feature by far was the 3.2” capacitive touchscreen – Nokia’s first. One in three voted “capacitive” but how the rest of the votes are spread out is pretty interesting too. The overall message of the poll is clear. To put it in Internet-speak “more capacitive touchscreenz plz”. 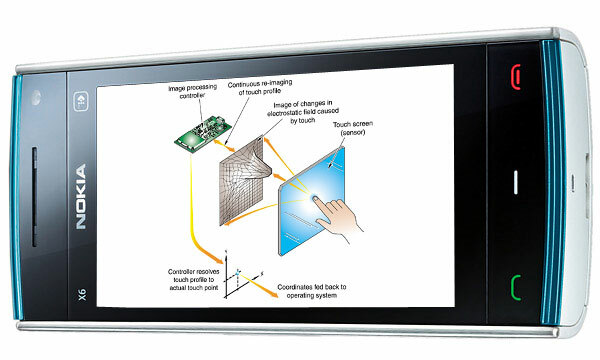 Nokia is no longer a newcomer to the touchscreen field – the Nokia 5800 XpressMusic came out long ago in gadget years. Anyway, Nokia has been in the business for years and years and I’m sure that they have predicted this outcome and there already have more new phones with capacitive screens in the works. Moving down the ladder, the 32GB built-in memory comes in at a distant second with 16%. That seems odd – the Nokia X6 lacks a microSD card slot but I can’t imagine anyone needing more than 32GB anyway. But 32GB microSD cards are not that far away, so this isn’t like when the first phones with microdrives came out and seemed to posses unimaginable storage. Anyway, “Its looks” is what 15% of people consider to be the best quality of the Nokia X6. People still think that Nokia has designer chops. The Comes With Music service and its 6 million tracks got a vote of confidence from 11% of people – quite a lot, considering the service doesn’t seem very popular. The rearranged homescreen and the 5-megapixel camera got an honorable mention but that’s about it. Symbian S60 5th edition even slightly tweaked still can’t win the hearts and minds of people and the camera on the Nokia X6 can’t either. It’s also interesting to see what’s missing – 8% of people voted “Nothing”. Some of those are undoubtedly people who are unhappy with the X6 but others chose this option to mean “Nothing’s wrong”. The WH-500 headphones that come in the box with the Nokia X6 weren’t even in the poll, but considering only 3% voted “Other”, the headphones are not a very popular feature it seems. It’s interesting however that we have some readers complaining that they’ve received their X6 without the headphones in question. Check out the poll at Nokia Conversations to get a better feel of why people voted the way they did.